Yaran, Ali. (1394). Investigating the Effect of Tall Buildings on Tehran City Landscape. معماری و شهرسازی آرمان شهر, 8(14), 81-89. Ali Yaran. "Investigating the Effect of Tall Buildings on Tehran City Landscape". معماری و شهرسازی آرمان شهر, 8, 14, 1394, 81-89. Yaran, Ali. (1394). 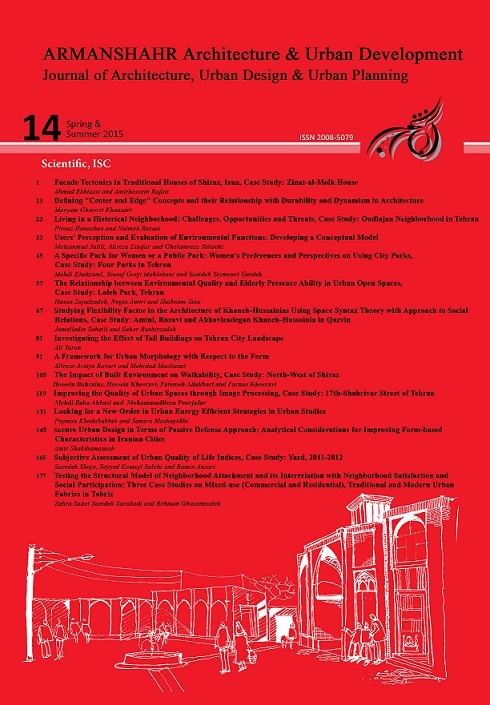 'Investigating the Effect of Tall Buildings on Tehran City Landscape', معماری و شهرسازی آرمان شهر, 8(14), pp. 81-89. Yaran, Ali. Investigating the Effect of Tall Buildings on Tehran City Landscape. معماری و شهرسازی آرمان شهر, 1394; 8(14): 81-89. Associate Professor of Architecture, School of Architecture and Environmental Design, Iran University Of Science and Technology, Tehran, Iran. Tall buildings despite their different features and impacts are just defined by their height. ignoring environmental impacts of buildings has developed more problems for the appearance of cities. buildings are respectively related to four factors of meaning, scale, view and identity. Mirbach, ed. and trans.). Hamburg: Meiner. Urban Planning, 37, 187- 196. Vitruvian Fallacy. New York: Wiley. Transformation to Detect Lines and Curves in Pictures. Communications of the ACM, 15, 11-15. Planning. Journal of Fine Arts, 24, 45-54. Keller, S. (1988). Review. Contemporary Sociology. Role of the Behavioral Sciences in Environmental Design. Aesthetics. M.S thesis, University of Tehran, Iran. McAndrew F.T. (1993). Environmental Psychology. of Signs. The Hague: Mouton. Naser, J.L., Lmeokparia, T., Tiwari, R. (2001). Skyline Entropy, Order and Preference. (Working Paper). Aesthetics. Landscape and Planning, 54(1-4), 223-237. Osgood, C. E., Suci, G. J., and Tannenbaum, P.
Planning and Design, 36, 698-710. Outlines of Aesthetic Theory. New York: Modern Library. and Urban Planning, 43(4), 217-225.